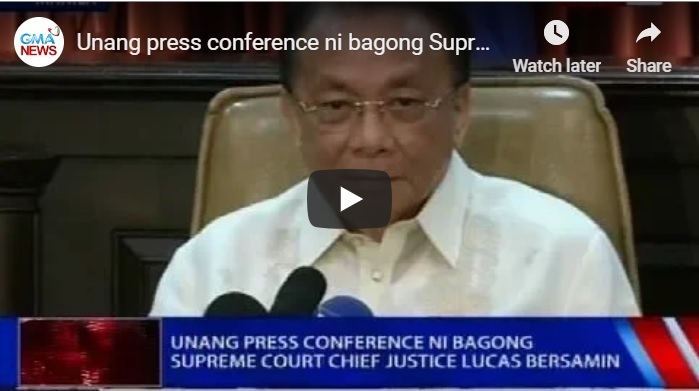 Supreme Court Chief Justice Lucas Bersamin begs for independence in the judiciary. He knows that Bongbong Marcos’ electoral protest against the presumptive Vice President, Leni Robredo divides the country. He, however, promises to make reforms during his 11-month tenure in the SC. Among his priorities are to make procedural law court proceedings to be less tedious, less intimidating, more economical and speedier. That would certainly help resolve the VP conflict. 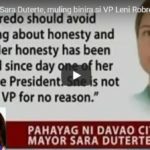 [VIDEO]: Isang Arroyo appointee ang bagong Punong Mahistrado na si Lucas Bersamin na bumoto noon pabor sa “Sereno ouster” at “Marcos burial” sa Libingan ng mga Bayani. 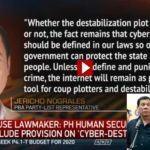 Giit ni Chief Justice Bersamin, pananatilihin daw niya ang independence ng hudikatura. Saksi si Dano Tingcungco. Bersamin emphasizes that the judiciary must remain independent. “We are part of a sovereign nation, the judiciary, but our role is to be an independent judiciary. 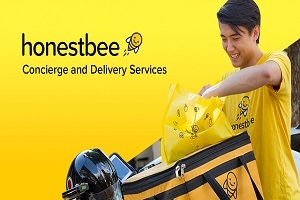 We cannot always go to the other 2 branches of government to ask for assistance,” he said. He is grateful to several stakeholders for helping the Philippine judicial system. This is by funding its projects. Bersamin takes over his Supreme Court post recently. He replaces Teresita Leonardo-De Castro who retired from government service in Oct after just barely serving as Chief justice for 3 months. Short as it may seem, these presidential appointees have it in their records that their decisions are in line with the President’s goal of serving the people. Earlier, the new CJ had something to ask: “Welcome me, I ask you to welcome me, to love me, to support me,” 25th Chief Justice Lucas Bersamin told Supreme Court officials and employees during his first flag ceremony as a head of the judiciary. 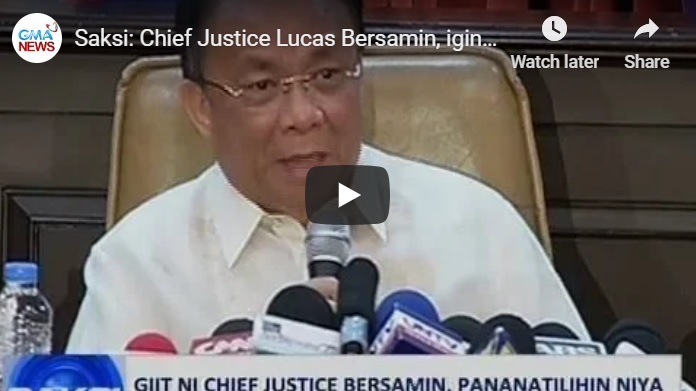 Bersamin added: “I am an accidental chief justice but that is not a statement of apology. I do not apologize to anyone for having been appointed because that is the wisdom of the President, who is the appointing power. Please accept me.” Despite his humility, it is obvious that the opposition is always insecure about Bersamin’s voting for the ouster of Sereno and the late President Ferdinand Marcos’ burial at the Heroes’ Cemetery. They can only guess how he would vote for the VP case ruling. Du30 appointed Bersamin to replace former chief justice Teresita Leonardo-De Castro, who retired on October 8. Aside from Bersamin, Associate Justice Ramon Paul Hernando and Associate Justice Rosmari Carandang also took their oaths of office on Tuesday. CJ Bersamin said that he trusts the wisdom of a President who is the appointing power. Please accept me, he begs during a flag ceremony at the SC grounds. Bersamin tells employees of the Supreme Court that those who were not there at that time, have reasons why they were absent. He accepts the fact that not all staff agree with the President’s decision. Bersamin was only the 3rd most senior justice out of the 4 applicants. The time-honored tradition of seniority has never been more pronounced at the High Court. 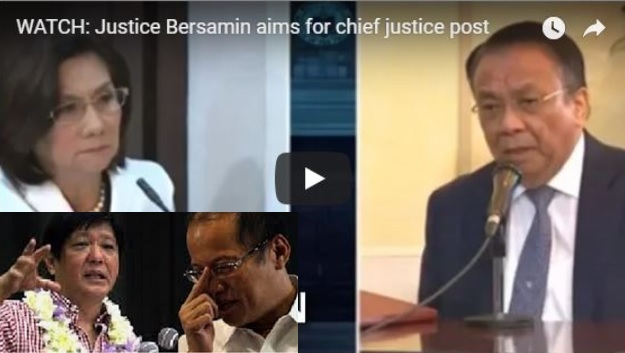 Malacañang explained that Bersamin was considered the most senior because he had served in the judiciary the longest. He has served as a judge since 1986. However, he is not the most senior in the Supreme Court per se. Bongbong Marcos’ supporters bank on the President’s hand in finally fast-tracking the electoral protest of Marcos against the presumptive VP, Leni Robredo. PDu30 has no jurisdiction over the recount proceedings. The only thing he could do is to appoint a fair Supreme Court justice. A CJ that is in line with the ideals of the government. Bersamin’s record shows that he is for the welfare of the country and its people. The whole world is the witness on how their many detractors brainwash people to believe that the Marcoses are the most corrupt family in the world. Nevertheless, Bongbong Marcos never ceases to give thanks on everything that goes his way. Thanksgiving might be an American tradition but Filipinos also have the culture of thanking the superior being. The former Senator’s patience on his electoral protest against the presumptive VP Leni Robredo is formidable. It seems uncertain until President Rodrigo Du30 himself appoints the new Supreme Court Chief Justice, Lucas Bersamin over the more senior, Acting Chief Justice Antonio Carpio. This time, there’s a big chance that justice can be served. [VIDEO]: Thank you for the kindness you have given me and my family. 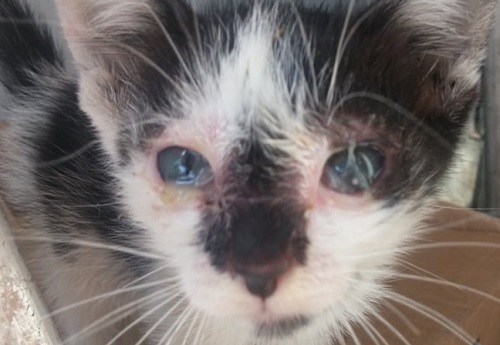 I don’t get to say this as often as I should, but we are deeply touched by your show of support. Mabuhay tayong mga Pilipino! Du30 in August said he follows the “seniority” tradition at the high court when he appointed Associate Justice Teresita de Castro to replace Maria Lourdes Sereno. The President considers Sereno as his enemy. Five names were in the shortlist of chief justice aspirants drawn up by the Judicial and Bar Council. Acting Chief Justice Antonio Carpio, Associate Justices Diosdado Peralta, Estela Perlas-Bernabe, and Andres Reyes Jr. vied for the chief magistrate post. Senior Associate Justice Carpio is the most senior justice in the SC. He serves the SC since 2001. Following him is Associate Justice Diosdado Peralta who was appointed to the SC in January 2009. Bersamin was a regional trial court judge in 1986 and was appointed as an SC justice in April 2009. 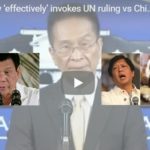 Among the most notable cases that Bersamin penned at the SC were the ruling that granted former Sen. Juan Ponce Enrile bail due to humanitarian grounds and the decision that there was no illegal retrenchment of more than 1,000 flight attendants and stewards of the Philippine Airlines. Bersamin will retire on October 18, 2019. Many posts mocking the Dilawans or the anti-administration stalwarts populate social media in the early hours. Their democracy is dead again, they said. Marcos loyalists hope that Bersamin would balance the alleged impartiality of Supreme Court Associate Justice Alfredo Benjamin Caguioa. The latter is former President BS Aquino’s classmate and his wife is an avid supporter of Robredo. He oversees the VP electoral protest. Marcos urges everyone that despite the hardships in life, one must continue to give thanks. Things can only get better for as long as we are still around. He is thankful that he remains in good health and still very fit physically, mentally, and emotionally to serve the Filipino people and his beloved country, the Philippines. Can AJ Lucas Bersamin’s Appointment as Supreme Court Chief Justice Prevent Scalawags? With the retirement of Chief Justice Teresita Leonardo de-Castro, Associate Justice Lucas Bersamin then accepted his automatic nomination for the post of Chief Justice of the Supreme Court. Shortly, before this, President Du30 appointed Associate Justice Paul Hernando from the Court of Appeals to the Supreme Court. So far, the President has appointed six associate justices in the SC. They are Martires, Noel Tijam, Andres Reyes Jr., Alexader Gesmundo, Jose Reyes, and now Hernando. Bersamin previously voted against the ousted Chief Justice Marcia Lourdes Sereno. [VIDEO]: Supreme Court Assoc. Justice Lucas Bersamin appeared before members of the Judicial and Bar Council (JBC) for a public interview as part of the application process for chief justice. With the mandatory retirement age at 70, Bersamin said he still has sufficient time to make the Supreme Court’s image better despite retiring next year. He underwent a public interview before members of the Judicial and Bar Council for the application process of the chief justice post. Furthermore, Bersamin says that he will grant more powers to the JBC should he be appointed as the next Chief Justice. This is to avoid making mistakes in appointing aspirants to judicial positions. He believes that the JBC needs more muscle to look into the qualifications of the applicants. Incidentally, he was one of the 8 magistrates who voted to nullify Chief Justice Sereno’s appointment. This is based on her alleged lack of qualification. With his appointment to the Supreme Court by President Du30, Hernando takes his oath of office soon after. He appears before Associate Justice Diosdado Peralta, who incidentally is his wedding godfather. In the CA, Hernando maintains an impressive record. He has zero backlogs, 417 disposed of cases in 2013 and 370 in 2012. With him being 52 at the moment, he still has 18 years to serve before the mandatory retirement age. “There is no insurance to these kinds of mistakes. I do not ascribe that to the JBC. I rather ascribe that to the shortcomings of the pre-vetting process,” quoting Bersamin. He believes that we should improve the selection processes of the judiciary. Because there are still undeserving people who manage to get appointed. However, he is yet to elaborate what additional powers he intends to give to the JBC. 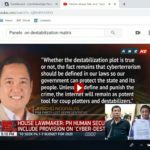 To quote Bersamin again, “The solicitation of reactions from the public about the candidates might be lukewarm because the public may not generally know, through inadequate publication, that this and that fellow who is applying is a scalawag to our community.” As another point of interest, Bersamin also wants to look into corruption allegations into the members of the Judiciary, should he be appointed. Under the rules of the JBC, the five most senior justices of the SC are automatically nominated for the post of Chief Justice should it be vacant. The most senior SC Justices are Bersamin, Peralta, Antonio Carpio who is the acting Chief Justice, Mariano del Castillo and Estela Perlas Bernabe. Chief Justice De Castro’s term may well be the shortest term in the high court’s history. However, this signals the return of the seniority culture in the SC that former President Benigno Aquino III disregarded by appointing Sereno. Aquino vowed to block Bongbong Marcos from the executive office in any way that he can.